The 2009 Jazz series at the Hollywood Bowl with Chick Corea, Stanley Clarke, Lenny White, John Scofield, Chaka Khan, Jean-Luc Ponty and John Connors. 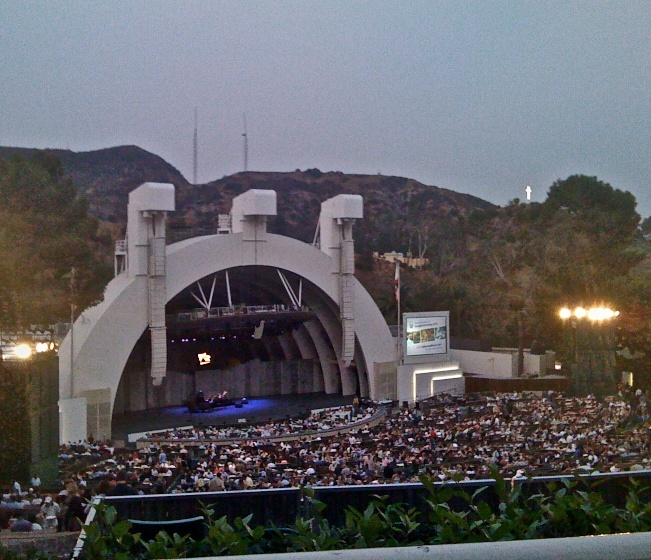 The setting was the Hollywood Bowl. The weather was absolutely gorgeous. A full moon hovered over a calm evening with temperatures hovering around the 25 degree mark. The tickets were a cheap 14 bucks a piece. We may have sat at the back but I wouldn’t have had it any other way. Besides watching the music being played from a long distance, the view around made it all the more special. There were two large screens at each side of the bowl which allowed some up close and personal moments if we wanted. We just sat back with our glasses of wine and took it all in. Halfways through the evening two figures appeared to the left of the stage, one guiding the other along the way to the piano. When the screen displayed the individual sitting at the piano, an uproar came from the audience. Stevie Wonder in all his glory. The excitement from the crowd was as boisterous as if you’re favorite hockey team just scored the winning goal to capture the Stanley Cup. Stevie joined the group for a few numbers with his trademark sway and smile. He made everyone’s life more special that evening. A story to be retold over and over again by the thousands of people at that concert.